I will be teaching a ceramic bead making class at The Beaded Frog in Greenville, SC! I have just added a two day class at The Beaded Frog in Greenville, SC. 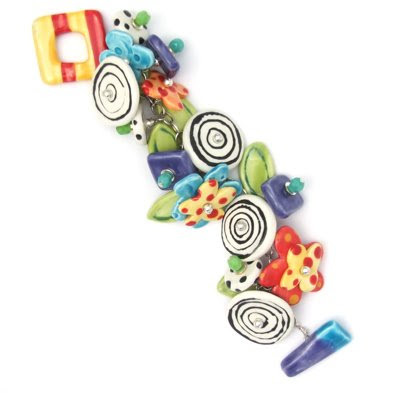 The first class is August 9th and that Sunday we will make a wide variety of beads, including the components that are in the charm bracelet shown above. Students will learn to hand form and cut out beads from the wet clay. We will make basic beads as well as toggles, links, charms, and more. I will include information regarding firing beads and loading kilns. I will bring back the beads(bisque fired) to the second Sunday class, which is August 16th. The students will spend the class glazing their beads.